Video: Oyster Oddities - Are You Paying Too Much For Your Journey? Geoff Marshall Video: Oyster Oddities - Are You Paying Too Much For Your Journey? You tap in, catch your train, and tap out the other end. And that's that. Or is it? When using your Oyster, everything isn't always as it should be. Did you know that an off-peak journey outside of zone 1 is charged differently by different franchises? Did you know that the Overground can be treated as both National Rail or tube/DLR depending on what other services are used? Watch the video above to see some strange Oyster fare charging in action, and how you can use them to your advantage. Some examples were just too complicated for us to go and make a video of. Here's one which we'll try to explain to you as simply as we can, highlighting that while Oyster and contactless fares are the same, the capping ISN'T always the same. If you use Oyster, it works out the charges at the time of when you touch out, and assumes the 'worst' about any further travel you might make that day. Contactless looks at all your travel together at the end of the day when it is processed, and works out the cheapest way to charge you for all the travel in one day. So... a journey from Upminster (Z6) to Oxford Circus (Z1) off-peak on Oyster costs £3.10. 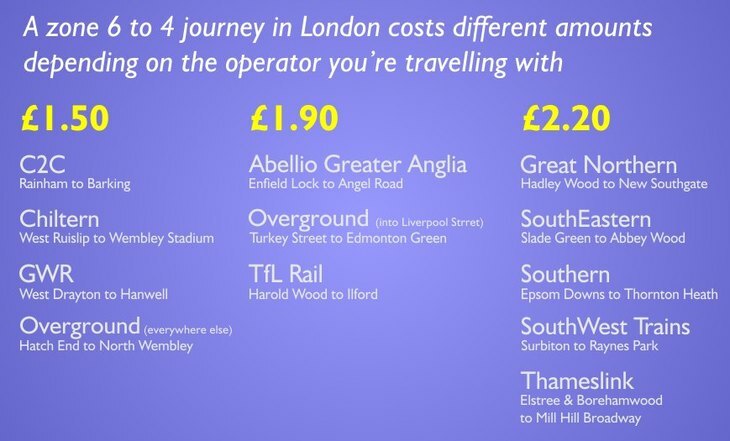 If you then make three more zone 1 tube journeys at £2.40 each, that's £7.20 you've paid — £10.30 in total. If you then go home from Bond Street to Upminster, that's £3.10 again and that'll hit the Oyster cap of £11.80 (zones 1-6). However, do exactly the same on a contactless card and it'll charge you the zone 1-2 cap of £6.50, plus two £1.50 zone 3-6 extensions — a total of just £9.50. Finally, here's a comparison table, showing you how different parts of the Oyster network charges you different prices for a zone to zone 4 journey. If you know of an example where it's cheaper to break a journey, or break an out of station interchange (OSI), or go a different way to get a cheaper fare, let us know in the comments. Why The Hell Do People Go To Harrods?